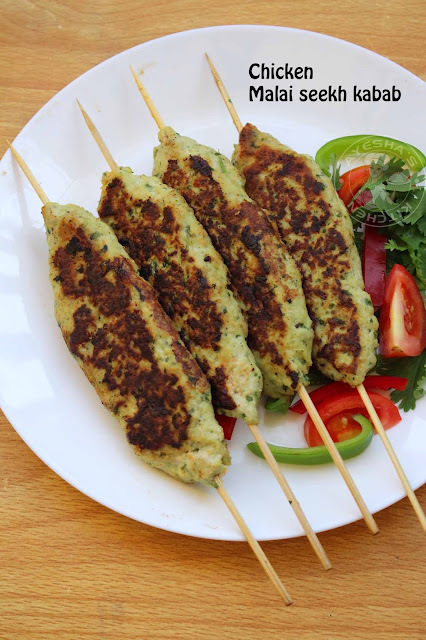 Kebab/kabab is a very popular grilled meat recipe. Shish kebab and doner kabab are the two main varieties in kebab. Basically kebabs are prepared using oven/ barbecue/grill but still you can make it at home on stove top too. So let's see how to make chicken kabab recipe on the stove top or without an oven. 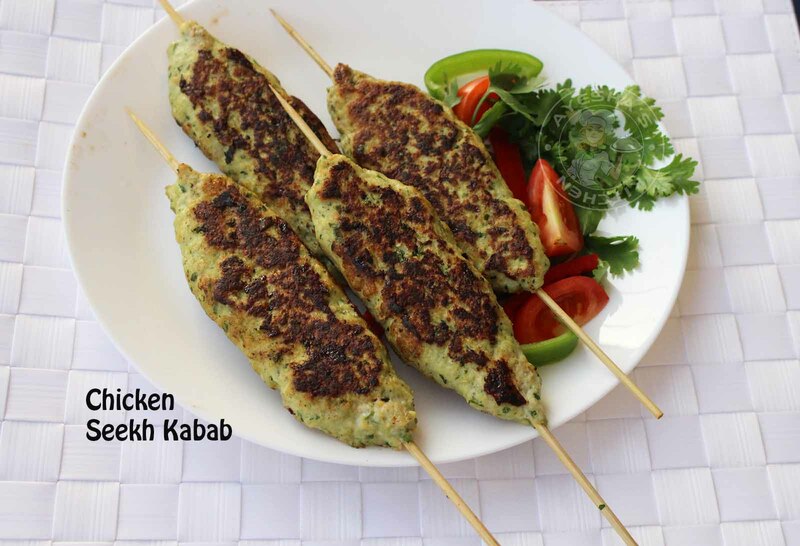 Shish / seekh means skewers and kabab/kebab means grilled and so chicken seekh kabab means grilled chicken on skewers. This recipe for chicken kebabs is less mess and easy to make. Minced meat and other spices are ground to make a dough like consistency and then skewered and later shallow fried on a big tawa or pan. The buttery flavor while tossing these chicken kebabs makes us drool. The skewered minced chicken is flattened slightly for even and quick cooking. Moreover, this chicken recipe or chicken snack is a right choice for iftar meals or snacks. You can even prepare this snack ahead of time and freeze. So that you can make your ifthar meal without spending more time in the kitchen. Many of my lovely readers requested me to share some make-ahead recipes during ramadan. 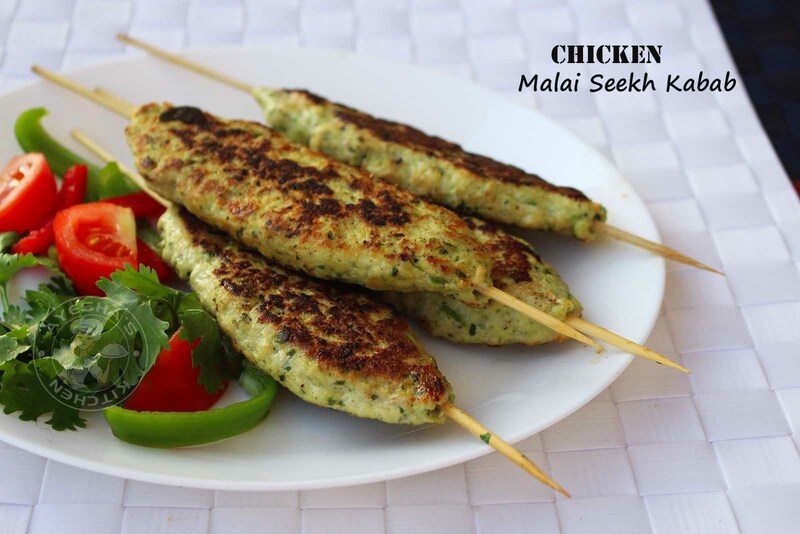 Hope this seekh kebab/chicken malai seekh kebab/ creamy seekh kebab is one that can be added to the category of make-ahead recipes. Isn't it? Hope I can share more Ramadan recipes for iftar, iftar meals, iftar snacks, iftar drinks, suhoor meals the coming days. Thanks to shanaz for this recipe. So here is the recipe showing how to make chicken seekh kabab on stove top /chicken kebab recipe /chicken kebab /kebab /chicken kabobs/kebab recipe /kabob skewers/stove top grill / easy freezer meals /easy frozen meals /iftar ideas /murgh malai seekh kabab. Pulse in a grinder for a second or two all the ingredients given under ' to pulse'. Do not grind more. Set aside. Heat a tawa / big nonstick pan with butter. Place the kebab over it. Shallow fry over a medium-low flame until all sides are done. (do not cook over a high flame). Serve hot. If in an oven - Place these skewered kebabs over a baking tray without touching the bottom of the tray (be careful). Sprinkle melted butter over kebabs and roast it for 7 - 10 minutes or until golden.